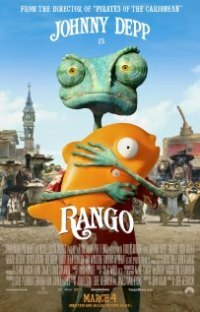 Gore Verbinski’s “Rango” is a rather strange film. From the trailers, you would think that it’s a film for kids what with all the lively animated creatures and silly humor, but it actually contains a good deal of adult material, so it actually falls somewhere in between. It’s mainly meant as an homage to classic westerns, so adults will probably be able to get what’s being referred to, but kids may be left in the dark. Luckily the film contains other attributes, such as wonderful animation and a great voice cast, which they too can enjoy. The film begins by introducing us to a chameleon (voice of Johnny Depp), who is traveling in his habitat in the back of a car that is driving through the desert. A near-disaster causes his habitat to be jolted from the car, leaving him stranded in the middle of the desert. A friendly armadillo (voice of Alfred Molina) tells him that a town is a mere day’s walk away, so without putting much thought into it, the chameleon takes off for the town. Eventually, he meets up with Beans (voice of Isla Fisher), a local from the town (known as “Dirt”). The chameleon is not exactly made to feel welcome in the town, but upon making up some heroic stories and saving the town from a hawk, he adopts the name “Rango” and becomes the new sheriff. The town is in the middle of a drought and even the local bank, where water is kept, is nearly dried up. It’s up to Rango to solve the mystery of the drought and bring prosperity back to this small desert town. “Rango” does have a lot going for it. The animation is simply amazing to watch and was done in a rather unusual fashion. The entire cast acted out the movie in order to get the most realistic motions possible while actually interacting with each other. There’s something else that’s simply great about the animation: It’s in good old standard 2D. No extra dimensions were wasted in the making of this film. The voice cast is top notch and includes a list of actors that would be great for any motion picture. Depp delivers a goofy and pleasant performance as Rango, but others may not be quite as recognizable, such as Ned Beatty as the Mayor, Alfred Molina as Roadkill (the armadillo), Bill Nighy as Rattlesnake Jake, and Abigail Breslin as Priscilla. Their performances are done quite well and really help bring these characters to life. Now we come to the bad news. As mentioned before, the story is meant as an homage to classic westerns (like those of Sergio Leone), so the film ends up being filled to the brim with clichés. The story itself is overly-simplistic and moves along at a snail’s pace. The weakness of the story becomes apparent very early on as it tries to fill up time with some well-animated, but rather pointless chase sequences. Once you realize that the film is going to follow the “outsider who comes in to save the town” formula, there isn’t much to do but sit back and wait for it to happen. Imagine my surprise to learn during the closing credits that the screenplay was written by the amazing John Logan, who has helped give us such great films as “Sweeney Todd,” “The Aviator,” “The Last Samurai,” and “Gladiator.” This seems more like something he churned out in a day or two of work. The references he puts in the film are somewhat interesting and include a tribute to an attack from “Apocalypse Now” and even a visit from “The Man with No Name.” As for the story itself, it just didn’t seem like he or the story’s other writers were trying all that hard. “Rango” certainly isn’t a bad film and it does score points for its beautiful animation as well as the talented voice actors involved, but as I’ve said time and time again, I find story to be the single most important aspect when determining how good a film is, and the story here ended up needing a lot of work. If the writers had dared to step a little outside the borders of the western formula or if they’d even just shaken up the old formula a bit, this really could have been something special, but sadly, it just ends up being pretty standard. 2.5/4 stars.